What Are The Uses Of Karaya gum? Acts as a bulk-forming laxative, thickener, denture adhesive, binder and stabilizer. What Are The Side Effects Of Karaya gum? Bowel obstruction if taken with the insufficient amount of water. What Are The Contraindications Of Karaya gum? 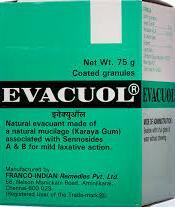 Hypersensitivity towards the drug karaya gum or any other allergies.